Consulting Engineers South Africa (CESA) has a proud history of always being at the forefront of driving positive change in the industry. Having been founded in 1952 CESA is proud to celebrate its Diamond Jubilee in 2012 celebrating 60 years of service to the industry.....and there is much to celebrate. The past decade has been momentous for both our country as well as the consulting engineering industry where consulting engineers have been lauded for the magnificent infrastructure that has been conceptualised, designed and project managed turning our country into a World Class destination for many. Sustainability and the protection of our natural environment has risen to centre stage with engineers now more than ever before being responsible for the wellbeing of humankind. Awards were handed out for the following categories: Engineering Excellence for projects with a value of less than R50million; projects between R50million and R250million and for projects with a value of over R250million; Best International Project; Visionary Client of the Year; Mentor of the Year; Business Excellence; Mentoring Company of the Year; Young Engineer of the Year; Publisher of the Year; Job Shadow Day; and Branch of the Year. The category of Engineering Excellence with a value greater than R250 million was won by HHO Africa for the Upgrading of Koeberg Interchange for the Department of Transport and Public Works Provincial Government of the Western Cape with BKS receiving a commendation for the Upgrading of the Ben Schoeman Freeway for the South African National Roads Agency. The category of Engineering Excellence with a value between R50million and R250 million was won by BKS for the Safety Rehabilitation of Klein Maricopoort Dam for the Department of Water Affairs. The JW Waste Water Partnership comprising Knight Piésold Consulting, Zitholele Consulting, PD Naidoo & Associates and the WSP Group received a commendation for the Northern Waste Water Treatment Works, Sludge Drying Bed for Johannesburg Water. 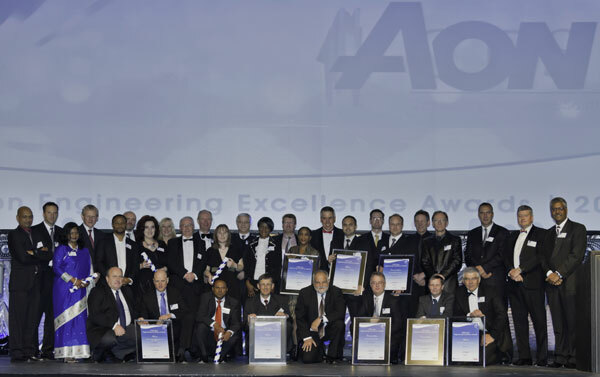 The category of Engineering Excellence with a value less than R50 million, was won by Aurecon for the Meulwater Water Treatment Works for the Drakenstein Municipality. Goba received a commendation for the Brakspruit Bridge Project for Transnet Freight Rail. In the category of Best International Project, sponsored by the Built Environment Professionals Export Council (BEPEC), Vela VKE Consulting Engineers part of the SMEC Group was announced the winner for the Baia de Luanda - Luanda Waterfront Development with Bosch Projects receiving a commendation for the Ubombo Sugar Mill in Swaziland for Illovo Sugar. SSI Engineers and Environmental Consultants won the Business Excellence category. In an effort to promote mentorship of young engineers CESA recognises the contribution Mentors make to the industry and the future of the profession. Bigen Africa won the Mentoring Company of the Year category and Andrew Brown from Golder Associates won the category of Mentor of the Year. In recognition of the role that the media plays in the industry, 3S Media and Crown Publications received recognition for Publishing Excellence: Trade Media and Independent Newspapers received recognition for Publishing Excellence: Daily Newspapers. In the Visionary Client of the Year category, CESA nominates candidates for the award, who must then consent to their nomination. Nominees in this category can be from the public, parastatal or private sectors, and are judged inter alia on their contribution to sustainable economic job creation in South Africa and or Africa. Creating sustainable development in communities through skills and knowledge transfer is an equally important factor. The judges also look at the opportunities provided for the growth and expression of professionals, including those from formerly disadvantaged communities. Projects should also have embraced innovative designs that highlight the ability of South Africans in the technological field. CESA this year gave recognition, in the category of Visionary Client of the Year, to the Gauteng Provincial Government and the Bombela Consortium for the Gautrain Rapid Rail link. In order to promote the Consulting Engineering industry to young professionals, CESA recognises the contribution young engineers make to the industry and to the future of the profession. Naturally the winner must be available to receive the award and attend the International Federation of Consulting Engineers (FIDIC) convention. Furthermore, he or she must be available to serve on CESA’s Young Professional’s Forum for a 12-month period. Judges look for outstanding performance in areas including technical achievement on a project; educational achievement; recognition such as awards received; contributions to sustainable development – such as environmental initiatives, social responsibilities, and community involvement. And finally, the winner in this category must have leadership ability, and contribute to the image of the firm and the industry as a whole. Once again, this year the Airports Company South Africa (ACSA) sponsored the Young Engineer of the Year Award, enabling the winner to attend the FIDIC convention to be held in Seoul, Korea this year. The winner in the category of Young Engineer of the Year is Imraan Mahomed from BKS. GIBB were announced winners of the CESA Job Shadow Initiative with GOBA 1st runner-up and MPA Consulting Engineers 2nd runner-up. CESA’s KZN and Western Cape Branches were joint winners of the Branch of the Year Award.